January 31, 2019 (Nashville, TN)—Abingdon Press announced today it will publish two new gift books from Jen Hatmaker, New York Times bestselling author. The first gift book will be for the 2019 holiday season and called 7 Days of Christmas. Inspired by and adapted from her breakout book 7: An Experimental Mutiny Against Excess, 7 Days of Christmas takes Hatmaker’s social experiment of restraint in seven key areas—food, clothes, spending, media, possessions, waste, and stress—and turns them into thoughtful and practical ideas for more generosity to capture the true spirit of Christmas. “I can’t think of a better season to apply the lessons of 7, and it is my great delight to bring my readers 7 Days of Christmas to help us discover the joy of less stuff and more Jesus in our families and communities,” said Hatmaker. 7 Days of Christmas offers inspiration for practicing both generosity and restraint during the Christmas season. It explores why each area is important to Jen and also applicable to most American families. Readers will see how each particular area of excess impacts the family unit, the community, and the world at large—complete with ideas on how to reduce thoughtless consumption and consider other practices that lead to less stuff but more joy. “Jen has what few thought-leaders have achieved—popularity and relatability across a wide spectrum of readers. We are thrilled to share her wisdom with people at Christmastime,” said Audrey Kidd, Chief Revenue Officer for Abingdon Press. Abingdon Press is the primary publishing imprint for The United Methodist Publishing House and has a tradition of crossing denominational boundaries with thought-provoking and inspirational books. Abingdon Press titles include a wide array of quality Bibles, Bible studies, small group studies, Christian living, devotional, academic, professional, and reference books published each year to enrich faith communities across the globe. Learn more at AbingdonPress.com. Jen Hatmaker, sought-after speaker, Big Sister Emeritus, and Chief BFF, is the beloved author of eleven Bible studies and books, including New York Times bestsellers For the Love and Of Mess and Moxie. Jen hosts the award-winning For the Love Podcast and leads a tightly knit online community where she reaches millions of people each week in addition to speaking at events all around the country. Jen and her hubby, Brandon, are founders of Legacy Collective, a giving community that grants millions of dollars around the world. The couple lives on the outskirts of Austin with their 5 kids: Gavin, Sydney, Caleb, Ben, and Remy, in a 1910-era farmhouse that they overhauled as stars of the HGTV series My Big Family Renovation. 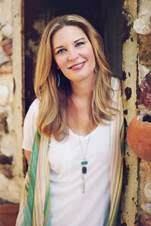 To learn more about Jen, visit JenHatmaker.com.